This playground is wild with its safari theme colours and safari animals. Kids can swing off a large basket swing held by a giraffe, sit on top of a rhino or bounce in a rhino or climb through a hippo. Enjoy the colourful and musical spots or play in the wooden house structure with climbing and sliding sections. The playground also features a caged merry go round, two swings for different children's age and a climbing tunnel in the main structure. Everything is nice and new and safe with soft floor throughout the playground. The only miss is that the playground has no fence, no toilets and no shade so come prepared. There is a creek bed built-in however it is not for water play. Overall, we like the new Safari Park in Werribee. A nicely themed playground with lots to do! 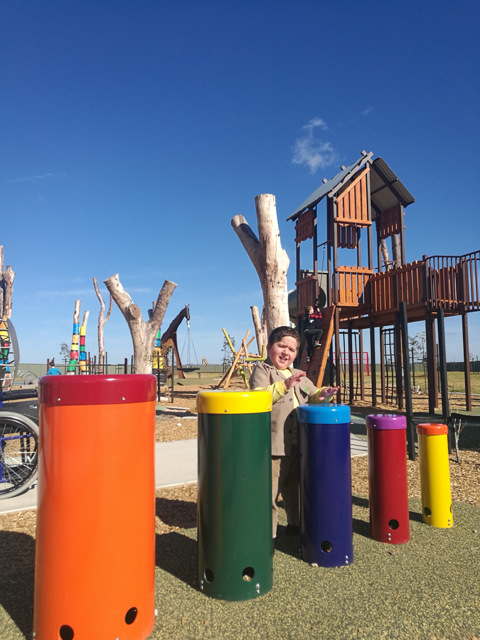 This playground is located at on Black Forest Road in Wyndham Vale.